Artisanally produced in the pristine waters of the Forestier Peninsula in the South East Corner of Tasmania, Blackman Bay Oysters are grown just south of Marion Bay in what is arguably one of Tasmania’s cleanest and most productive bodies of water. Our oysters embody the optimal conditions of their eco-system, which is why experiencing Blackman Bay Oysters is like placing the ocean in your hand! The nutrient rich waters of the wild Southern Ocean roll in from both ends of Blackman Bay and the surrounding landscape is largely isolated and free from human and agricultural impact, culminating in an extremely pure and healthy estuarine environment for our oysters to flourish. The crystal clear waters of the lease combined with our carefully honed boutique farming practices has resulted in our award-winning, premium oysters receiving national recognition as among the best in Australia. 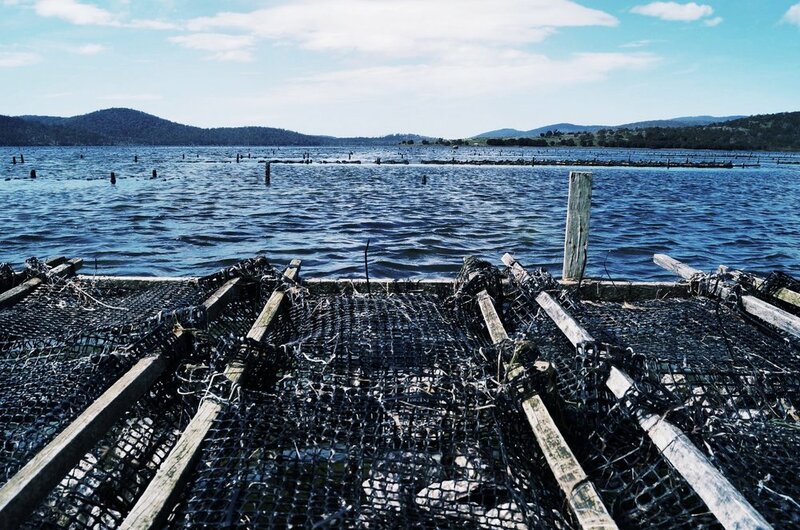 The farm enjoys both sub-tidal and intertidal blocks of water, a rarity that enables Blackman Bay Oysters to be nurtured from 2mm seed into premium restaurant quality oysters. Our bespoke farming practices produce a smaller and more delicate oyster, making Blackman Bay Oysters highly sought after by chefs right across Australia and regulars on the menu at award winning restaurants. In Hobart they may be found at Franklin, Glasshouse and Peppermint Bay. In Melbourne at Supernormal, French Saloon and The European or indulged in with an Oyster Butler experience as part of your next event, with the oyster butlers proving popular right across Australia at sporting events including the Portsea Polo and corporate boxes at the MCG, as well as weddings and corporate functions. With a focus on quality over quantity, Blackman Bay Oysters are artisanally grown using unconventional farming methods unique to our farm. Our dedication to our craft and years of research and development sees us producing oysters of an exceptional standard. Beginning their life cycle within our sub-tidal lease, the oysters are then transferred to the intertidal areas of the bay where they are meticulously hand graded and rolled onto high racks to ensure a unique hard shell and uniformity. Finally the oysters are placed high up on an intertidal rack, where they are out of the water for 16 hours per day, allowing them to channel most of their energy into growing and conditioning meat rather than shell. This process provides Blackman Bay Oysters with their trademark qualities of a bulging top lid, outstanding meat to shell ratio and strong adductor muscles that promote water retention. This ensures the fish is live and fresh until the point of serving at restaurants or events – a prized characteristic sought after by connoisseurs and top chefs alike! With a delicate merroir, Blackman Bay Oysters are smaller and sweeter than is typical of the species, giving them a unique flavour and making them easier to consume at a garden party whilst sipping a glass of champagne!